Having a beautiful pillow back sofa is awesome. It’s more than just a piece of furniture, it’s like the spirit of every home. The one place where you feel most “at home” is the sofa. I love the pillows, I love cuddling with my dog, I love throwing and rearranging pillows! Unfortunately, a great sofa could be easily ruined by a small kid, pet or even by you if you are not careful and being careful is not the thing I would like to be when I just want to relax. 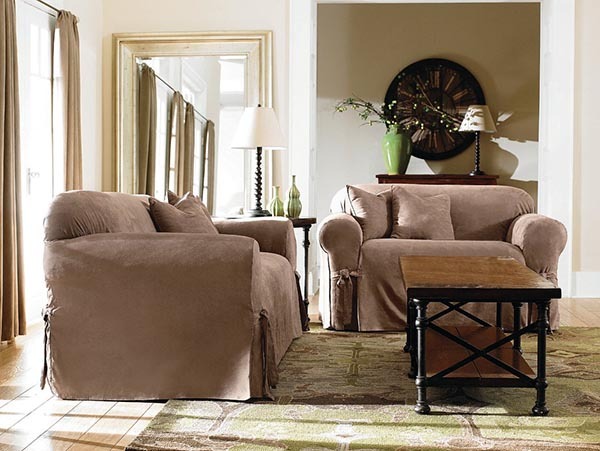 Some years ago, a lot of people were facing the same problem and came up with a nice solution – sofa slipcovers. They should’ve thought about some basic parameters – price, practical use and good looking. I suppose at the beginning they failed, but nowadays slipcovers are cheap, nice designed and do their main job – protect sofas perfectly. 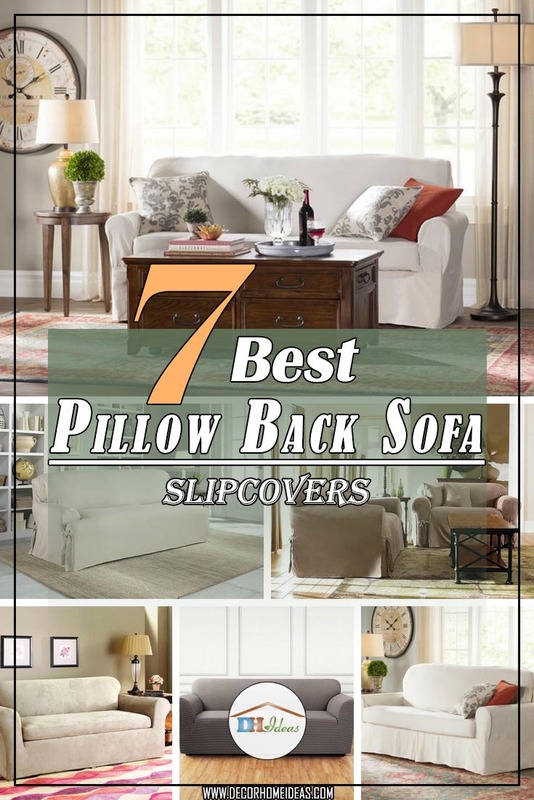 I’ve made a selection of 7 Best Pillow Back Sofa Slipcovers that you can use to update your living room, protect your sofa and it won’t cost you a lot of money. This one is very well designed, even though not so cheap as I wanted to be. I must admit it looks great and you don’t really care what is beneath the slipcover as long as the sofa is still comfortable. In this picture there are no pillows, but you can easily add them with the appropriate cases. It’s made of cotton for maximum comfort and durability. 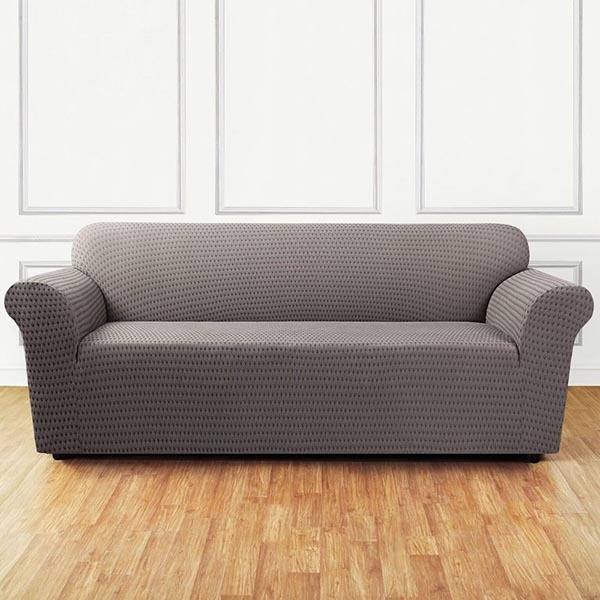 Big advantage is it comes with adjustable ties and labeled tabs so you can fit it to almost every type of sofa – camel back, three cushion T-sofa, loose cushions sofa and many more. The best thing – it’s machine washable. 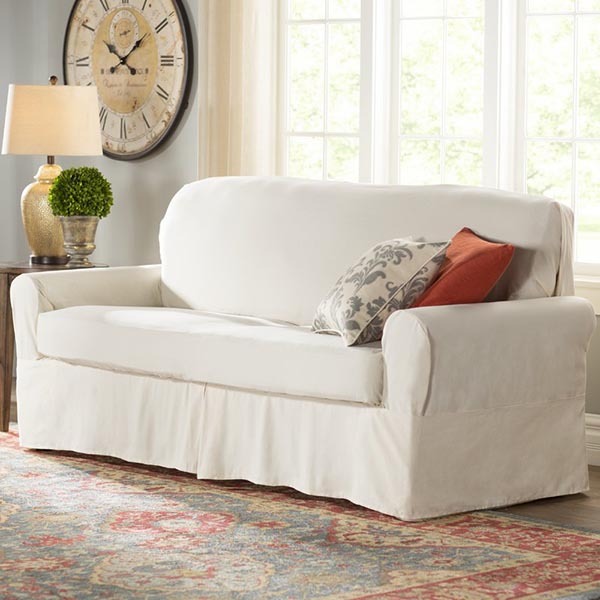 If you are ready to spare some more bucks on a stylish slipcover – that’s the one for you. If you want a lot more different look to your sofa or just want to update it, here is a great option. This pillow back sofa slipcover is made of cotton, slightly loosen and could be tucked and tied to different sofas. The back is fully covered and the fabric is stretchy enough to cover all details. It’s also machine washable and provides excellent protection. This pattern could be complimented with pillow cases with similar design or even pillow in bold colors. Compared to some of the other options – it’s relatively cheap and affordable if you are on a budget. One of the all time best selling pillow back sofa slipcovers. If you need a slipcover I would highly recommend you this one. It could fit any sofa from 78″ to 96″ because it’s soft and stretchy. Could be fitted to a camel back or a square back sofa with non-removable cushions. Available in different colors, it could change the look of the whole living room. It’s thick enough to hide patterns and is machine washable. Be careful not to wash it on high temperature as it tends to shrink and could not fit to the sofa again. One downside is that if you have a sofa bed, you need to remove the slipcover to use it. If your sofa is smaller then this one could be a perfect fit. It’s a relaxed fit with ties so you can adjust it for your furniture. It’s made of polyester which is not my preferred fabric for slipcovers, but it’s in the low price range so it’s acceptable. Fabric is elastic so that it can fit around the arms and back. Could be used on flip-out leg rest couch. It will do the job of protecting your sofa and update the look so you could give it a try. 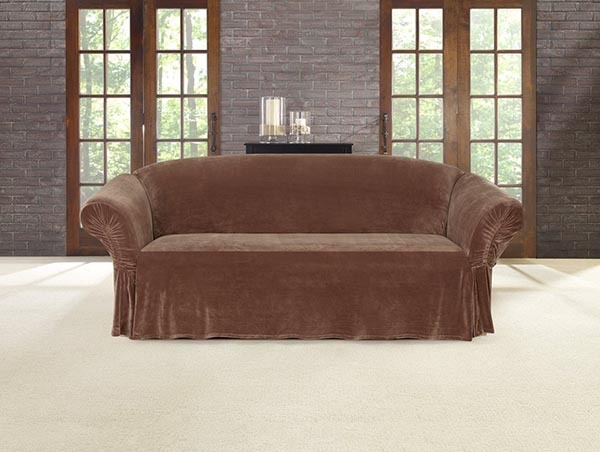 If you like plush, than we have a pillow back sofa slipcover for you. It’s more on the luxury end of our selection and is a bit pricey. And If your interior allows to have a plush slipcover, why not? Unfortunately, the only color is brown, so you have stick with it. A good thing is that it is washable and elastic to fit perfectly to your couch. It’s made of two-way stretch knit and will follow the contours of your sofa. You can fit it on sofa with square or box cushions. Pleats at the inside back and arm intersection are to minimize the fabric you need to tuck. It can also fit on a T-cushion sofa. Looks very original and stylish. The fabric is very soft – material used is polyester. 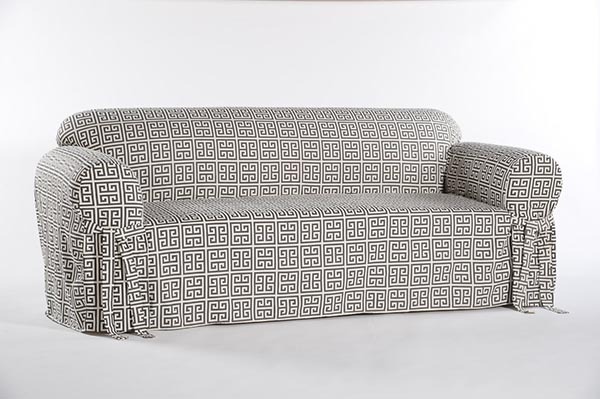 It’s made of two way stretch knit to follow your sofa contours. Could fit on a square or box cushions. Designed for sofas with removable seat cushions and removable back cushions. Smart seam details and elastic bottoms help create a custom, reupholstered look. The price is higher than the similar slipcovers, but you get a higher material quality. I suppose there are a lot more options on the market, but I’ve been searching for the best pillow back sofa slipcover for ages and trust me these are the best. You can make your own research and come back later, let’s say after several days just to confirm there is no better list. Anyway, I hope you will find your best sofa slipcover and stop worrying about ruining your couch. Nobody wants to destroy a $2000 sofa when you can save it for less than $50, right? Moreover, if you have a small kid or a pet, than the question is not if you will ruin your great sofa, but when it will happen. It’s just a matter of time.